The video documents one of the two “trials” that took place in Luuka district, Uganda, back in late 2012. In the video, we see people screened for malaria using an antigen-based rapid diagnostic test. The specific test used in the video detects malaria histidine-rich protein II (Pf HRP-II), which is expressed by one of the five malaria parasites Plasmodium falciparum. The manufacturer claims that it can detect the presence of 50 parasites in 1 micrometer of blood, however, Pf HRP-II secreted by the parasite into the hosts bloodstream can persist in the circulating blood after the parasite has been cleared, or has been greatly reduced. This means that, just because a person tested positive using this method, does not necessarily mean that they are infected at that specific moment in time. This is why these rapid tests are intended to be used for screening, and that any positives must be confirmed with an alternative testing method. Another problem with relying on antigen-based rapid diagnostic tests is that in malaria-endemic areas, like Uganda, malaria transmission is so intense that a large proportion of the population is infected but not made ill by the parasites. According to Dr Okul Albert Peter, the Malaria Control Programme manager in the Ministry of Health said that about 42% of Ugandans are host to the malaria parasite. Such carriers have developed just enough immunity to protect them from malarial illness, but not from material infection. 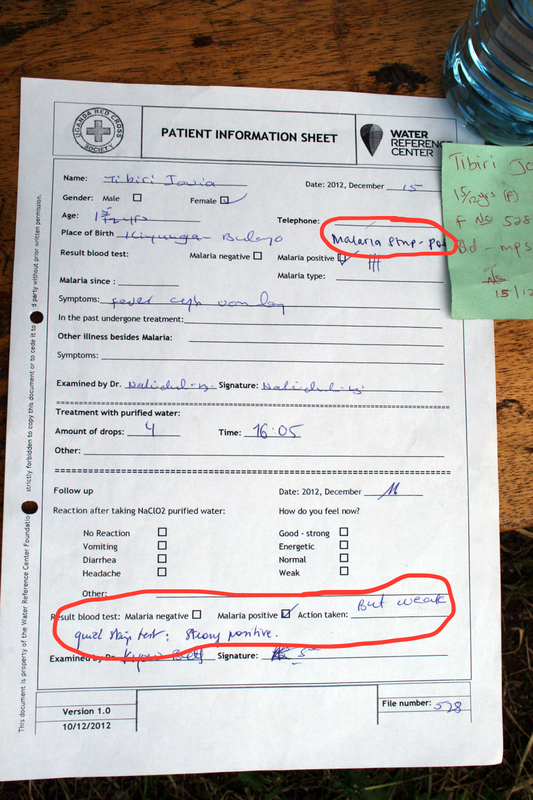 These malaria infections would be detected by the rapid antigen test, but not by the “gold standard” for laboratory confirmation, a blood smear. This is where a drop of blood is smeared on a glass slide and stained before the number of parasites and leukocytes are physically counted. What happens next in the video is a little hard to follow and contradicted by virtually everyone. Klass says that those who tested positive for malaria using the rapid tests were then taken to the lab for “under the microscope tests” on the same day. He then goes on to say that those who tested positive were offered a dose of MMS in a half cup of water, and asked to return the following day. 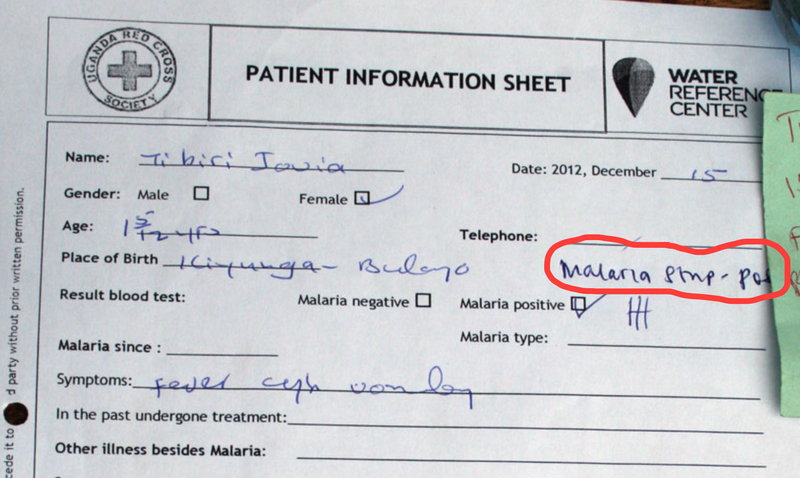 When they returned, all but one tested negative for malaria. However, the number of tests used in this “trial” is contradicted by Leo Koehof in the same video, who states that only two tests were ever performed. Leo’s version of events is also backed up by the paperwork used during the “trial” which only every says that a rapid test was used on the first day to determine a person’s malaria status. What’s more confusing is that in one of Klaas’ rambling emails where he refused to answer my questions on the timing and the amount of tests performed, he basically said (in his broken English) that they never had evidence that they cured malaria in the first place. Although, quite frankly, I don’t think he has a clue what he is talking about. If I have made any statement so far, it was in my (stolen) private footage and those statements were made before we found out other stuff in our research,and that is why they cannot be public – they are no more valid today. for example: at the time of the internal statement, we had not yet tested the enzymes in the blood and that is the only secure way of claiming a person is freed from malaria. And so, as we had not yet tested on enzymes, all our findings and claims only deserved an interim statement and not yet a conclusive one. That is why my camera statement are to be considered a reflection of our findings at that point in time, which is now by far outdated. But the results on symptoms and parasites in the blood were at that moment clear and needed further research , that remains. Even the part about only those testing positive for malaria were given MMS is contradicted by one of the Red Cross volunteers, Kerstin Wojciechowski, who stars in the video (and has not replied to any of my messages). Tested negative or positive, people were given purified water which was prepared by Ronald, Enno and me. Thereby the amount of drops of water purifier varied by age and malaria status. After taking the purified water people were also given bottled water to take home as they had to drink a lot for the chemical to take action in the body. Kerstin also documents on her (now deleted) blog some of the side effects people had after having ingesting MMS. The immediate reactions after taking the purified water were worrying to me: People disliked the smell, taste and some children had to vomit. Unfortunately we had to tell people that these symptoms might carry on at home for the day. This is why I put so much effort into contacting the people who were part of the “trial” – to try and make sense of what happened. However, with the information I have provided, I think you can make an educated guess on how they were able to make it look like they had cured 154 people of malaria. They thought that all the positive results obtained from the rapid test screening on the first day were accurate. Then, they retested those who tested positive using the blood smear method on the second day, and discovered that the vast majority were false positives as they fell below the threshold. They then miscredited this drop in people testing positive to the MMS given between the testing. This is backed up by the fact that none of the paper work in the trial shows the parasite to leukocyte ratios, or that a second test was ran on the first day. With regards to the middle test, which is claimed was performed immediately after the rapid test on the first day, I can think of two explanations. The first is that they are flat-out lying to us, and there never was a middle test to confirm a positive result. This would have been really easy to do in the editing room and, in my opinion, is what likely happened and is backed up by the fact there is no mention of any false positives from the rapid test. The second explanation is my own theory that I have come to after finding footage from a second pseudo-clinical trial that is almost identical to the first one. This one, however, sheds a little more light on the supposed middle test and says that it was only used to determine how much MMS to give a patient. So,to clarify, the rapid test is still being used to determine if you are infected with a malaria parasite and, rather than being used to remove false positives, the blood smear is being used to quantify the amount of extra MMS to give to these people. What’s disturbing is that the tactic of relying on rapid tests to give false positives is nothing new, and proponents of MMS have been seeking out the world’s poorest and most vulnerable to use as guinea pigs to experiment on for some time now. In my research, I came across a man named Isii Muturou who, for years now, has been doing the exact same thing seen in the Uganda “trials”. It has been just over 4 years since this unethical “trial” took place that used the innocent Ugandan people as lab rats to test their knowingly dangerous chemical on, and we are still no closer to finding out what happened. Yes, the organisations involved have distanced themselves as far away as possible from this debacle, but without publicly explaining why their representatives are there and how they are involved and bringing more attention to this atrocity, they are still lending their credibility to these woo-peddlers. And everyday that video remains up, more vulnerable people are going to be conned into drinking industrial bleach to cure all their ailments. One last thing! To anyone who thinks that they successfully cured everyone who tested positive for malaria, I want you to have a look at the form below. It’s the data from a one and a half year old child who was forced to drink bleach and still tested positive on the final day of the “trial” (16/12/12), when Klaas said that everyone was cured! My son had malaria in Africa and was tested positive in the hospital. After treatment with MMS (only 24 hrs!) he was cured!